We’d love your help. Let us know what’s wrong with this preview of Golden Days by Carolyn See. To ask other readers questions about Golden Days, please sign up. wow, i bet this book drove a lot of people crazy. people who were looking for a good post-apocalyptic nightmare, people who were looking for death and devastation, people who were looking for a polemic, those who wanted to see good (sigh) triumph over evil. this book isn't really any of those things, altho it contains events that would, among the unimaginative, be the perfect setup. but Golden Days gives us a nuclear holocaust with none of the above dressed in their usual attire. this book does tw wow, i bet this book drove a lot of people crazy. people who were looking for a good post-apocalyptic nightmare, people who were looking for death and devastation, people who were looking for a polemic, those who wanted to see good (sigh) triumph over evil. this book does two things to perfection: it paints for us the california of the 70s & 80s, haloed by golden light; and it tells us how the vast majority of us will end up walking into the end of days. our protagonist is not what you might call political. she doesn't obsessively follow the events that will lead to devastation. in fact, she hardly notices them at all. like most people, she goes about her days; unlike most people, she looks quite a bit harder for her own kind of happiness. still, her concerns are largely personal, not geopolitical, and among her friends a kind of obliviousness is the norm. which, i think, is true of most people. even the well-informed are not well-informed on everything, and an even smaller percentage of the well-informed are habituated to sustained critical thinking (if the news tells me X, how do i know it's true? and if it is true, what does it imply? etc.). so even when the end is nigh, she's out looking for a really great lunch rather than a sturdy underground shelter. and it may be hard to swallow, but i'm pretty convinced that's how most people would be. you know how little kids, when imagining scenarios of them versus some larger, stronger opponent, will start tossing out improbable scenarios? "ya, and then i'll get a bunch of vegetable oil, and i'll throw it on the ground, and he'll slip when he runs at me and fall and then i'll jump him!" i bet most people's inner disaster scenarios are something like that. but when the moment actually arrives, one finds the vegetable oil in short supply, and what else is there to do? go have a really fine lunch, the best one to be found. This review has been hidden because it contains spoilers. To view it, click here. Her eyes were wide. She gazed at me with terrific concentration. "Yes, she said, "I understand what you are saying. I get it. But isn't it true--that your fear of nuclear war is a metaphor for all the other fears that plague us today?" My mind had never been exactly fine. But sometimes it has been good. "No," I said. I may have shouted it out through the beautiful, sheltered room. "It's my view that the other fears, all those of which we have spoken, are a metaphor for my fear of nuclear war." The Her eyes were wide. She gazed at me with terrific concentration. "Yes, she said, "I understand what you are saying. I get it. But isn't it true--that your fear of nuclear war is a metaphor for all the other fears that plague us today?" The threat of nuclear annihilation seems in some ways a memory of a by-gone era. Back in the eighties, and especially in California we lived in the shadow of our many Air Bases that could go on alert at any time. At some point you just had to stop thinking about it. I suppose in some ways it is still very much there and real, but it seems much less in our faces than global warming or terrorist attacks or even just a gunman showing up one day. Or maybe those fears have just replaced that one. This book is in some ways very strange. In the first 85% of the book our heroine is a divorced single mom making her way through a man's world in the California lifestyle of the eighties. She takes husbands and lovers, raises two daughters, creates a bank and teaches wealthy housewives how to invest and create their own wealth. She sees all the craziness of California excess and success in the form of pseudo religion and success gurus. We learn her views on men and feminism. We meet her best friend who eventually becomes one of those success hucksters. Carolyn See captures California wonderfully. And then BOOM. 85% of the way in--the world ends. Very unsettling book but the prose is wonderful. I hope the author Carolyn See was able to exorcise some of her own fears in this writing exercise. I learned about this book from an article in the Guardian on Reading American cities: books about Los Angeles. It is also a part of a series of reprints from the University of California Press on California Fiction. All of the books included in the series have been selected for "their literary merit and their illumination of California history and culture." So far this book is SO weird. Carolyn See is sort of the grand dame of serious California/Los Angeles fiction. This book is one of those writers' writers unheralded classics, and I've been wanting to read it for a long time. It begins in Topanga Canyon in the summer of 1980, and it feels like the late 70s and early 80s. I mean, it is saturated with this uber authentic sunny narcissism that somehow believes itself to be feminism, and is also a bit classist and racist. It's creepy, truth be told. So far this book is SO weird. 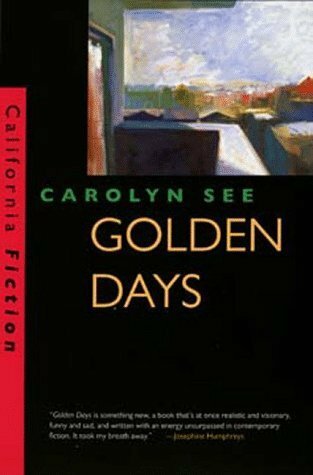 Carolyn See is sort of the grand dame of serious California/Los Angeles fiction. This book is one of those writers' writers unheralded classics, and I've been wanting to read it for a long time. It begins in Topanga Canyon in the summer of 1980, and it feels like the late 70s and early 80s. I mean, it is saturated with this uber authentic sunny narcissism that somehow believes itself to be feminism, and is also a bit classist and racist. It's creepy, truth be told. I kind of can't stand the narrator, but the more I read, the more compelled I am to keep reading. The more I read, the more sadness tinges the edges of the pages. Doomsday approaches. I have no idea how I'll feel about this book when I finish it, but I am very curious to find out. Hmmm... it looks like I never returned to complete this review. I'm afraid that in the year that has lapsed since I read it, my memory of the novel has faded somewhat, and what I'm left with is this ossified sense of its strangeness. I don't know if this novel was meant to indict the self-indulgent ethos of "finding yourself" that underlies the frippery of the New Age movement, but I came away from this book believing that the destruction wrought upon these characters is somehow the byproduct of their self-satisfied "seeking." This book touched me in such a deep way. It actually spoke to me. It spoke to who I am, how quirky I can be and it spoke to who I would like to be: without worry. In the plot of the book one thing sang to me constantly: the people who were facing supremely troubled times decided to either be happy or panic. Those who opted for happiness left convention and went to those they loved - regardless of how that love was defined or manifested. This concept alone made this book worth reading and loving. This book touched me in such a deep way. It actually spoke to me. It spoke to who I am, how quirky I can be and it spoke to who I would like to be: without worry. In the plot of the book one thing sang to me constantly: the people who were facing supremely troubled times decided to either be happy or panic. Those who opted for happiness left convention and went to those they loved - regardless of how that love was defined or manifested. This concept alone made this book worth reading and loving. The female protagonist holds visions of her child running in good fabrics, in good light, in good times and this sustains her. I think this is a good thing to learn. If for no other reason I was glad to read this wonderful book just to reinforce that learning. However, I loaned this book to someone.We were on vacation in Baja. When he finished the book he stood up from his lounge chair and used his baseball throwing arm to fling my book deep out into the saltwater! I loved it... obviously he did not feel the same way. I searched for Carolyn See for years afterward. The book was not to be found. Finally I was able to replace it when it was reprinted recently. I still love it. Even after rereading it I can't understand why he thought the book needed to be put to a soggy death. I love books that love Los Angeles. It's so easy to just dismiss it as shallow and full of traffic and posers and smog, and it IS all that, but there's also that sense of possibility that comes with not having a huge weight of history slapping you in the face every time you turn a corner. And those beautiful mornings that smell like flowers. I loved how much this book brought me back to my childhood years in southern CA, with my parents' kooky friends who were into self-actualization as well as m I love books that love Los Angeles. I loved how much this book brought me back to my childhood years in southern CA, with my parents' kooky friends who were into self-actualization as well as making lots of money. And in the background, that constant nebulous threat of nuclear war, which, at age 8 or so, I really had no idea what it meant, only that our president was BAD. This was recommended to me as a "post-apocalyptic" novel, but really it's more pre-apocalyptic, with just a little bit of apocalypse at the end. One of a number of novels written in the 1980s shaped by the possibility of the "unthinkable," i.e. wide-scale nuclear war that would mean the end of civilization. See seems almost Nietzschean in her belief that nuclear war could be the source of renewal — her portrait of latter-day American civilization, a wasteland characterized by relentless desires and even more relentless fears, may be more bleak than her rather graphic description of life after nuclear war. I agree with many of the reviews here. A very bizarre book that took me on a wild ride. Parts of it were hateful. See's language was snappy and sometimes hard to follow. I finished it confused, surprised and intrigued. It made me want to read more of See's work but not right away. I need to recover from this one. This is very good post-apocalyptic fiction. Set in southern California in the recent past. What I learned: don't bother with New Age philosophy, brush up on Stone Age philosophy. If Thomas Pynchon had been born a woman, this might be what he would have sounded like, but without all of the Pynchonian craziness. See is much more grounded in her writing, but does take flights of fancy within reality. Although this book was written almost 30 years ago, it still feels incredibly relevant. Unlike anything I've read before but in an incredibly good way. High Feminism without male bashing. There is something about this book that draws me back again and again. Apocalyptic, full of wish-fulfillment, and somehow, really steeped in Californianess. Holds up well, as magical realism apocalyptic fairytale. Some of the images still haunt me. And isn't it weird to look back at a time when I fully believed a nuclear holocaust was coming, would come, any day? I kind of wish I knew when that particular fear left me. Interesting read. I almost didn't finish it but it has a bit of a payoff at the end. i heard about the book on NPR and was intrigued enough to find it at the library. I'm still digesting it. I think it definitely stays with you. Read this for the first time many years ago and again several times since. I love this book, along with See's later one, The Handyman. This is smart, funny, inspired fiction with a genuine beating heart. This one rocked my world. I'm going to read it again over the turkey day break. I really enjoyed this book, but it's bizarre and unsettling. Los Angeles seems to inspire a lot of hallucinogenic writing, and I am more than happy to read it because it feels like home. This one was a hard read. At times, I was so drawn into the stream of consciousness meets end of the world fiction, but just as often I was completely confused. The ending was hopeful though. this is another one of those 'only four stars because it was so utterly terrifying' books. but don't let that stop you, it's also utterly brilliant. A dazzling book of beauty and pain. Golden Days takes us through the ingenuity and persistence of the human spirit in the face of fear, including the dark side of this; fear and human idiosyncrasies that can cause us to self-destruct an entire civilization. It’s not exactly scifi or post apocalyptic, Don't get fooled by the 'nuclear war' phrase on the book's own jacket blurb. To me it reads more like a satirical evaluation of 60s/70s/80s LA culture, but the promised ‘nuclear war’ does factor in A dazzling book of beauty and pain. Golden Days takes us through the ingenuity and persistence of the human spirit in the face of fear, including the dark side of this; fear and human idiosyncrasies that can cause us to self-destruct an entire civilization. It’s not exactly scifi or post apocalyptic, Don't get fooled by the 'nuclear war' phrase on the book's own jacket blurb. To me it reads more like a satirical evaluation of 60s/70s/80s LA culture, but the promised ‘nuclear war’ does factor in the character’s behavior to an extent. By the way, have to say Carolyn See’s writing is clever and satisfying. Her sentenced are dense, jam-packed with adjectives and mundane observations, yet still manage feel natural and move the plot along. Sometimes reminded me of Don Delillo’s style. That was not afraid to be flawed or week, yet the women in this book are central and powerful. He ate boiled rice and vanilla cream, and he said he didn't think there were any good women writers. But, I said, what about Carson McCullers? He said he didn't think of Carson McCullers as a writer. But, I said, what about Virginia Woolf? And he said he didn't think of Virginia Woolf as a woman. And I never heard a lady say she didn't like men writers because she didn't think of Shakespeare as a writer and she didn't think of Hemingway as a man! And all that to help us understand why a man might have caused conflict. The foreshadowing of 'what's to come' (aka that promised 'nuclear war') felt underdeveloped. like it didn't sit in the narrative well. Why use foreshadowing at all if you're not gonna add enough description or in-depth commentary for the readers to consider the build up. Also I didn't really like the way race was treated. Yes, we're talking about housewives in wealthy 80s LA, and the book is first-person narrative, so obviously the character could be allowed some prejudices, but there's a lot of 'othering' going on (all the black, Mexican and brown people starting wars and coming after the rich white people's children) that doesn't really get discussed, developed, or framed in such a way that I, the reader, can distinguish between character and author opinion. I just get the sense that this kind of casual treatment wouldn't go over well today, and it sometimes made me feel uncomfortable in a way I can't quite explain. A single mom makes her way through the hectic times of early 1980s Los Angeles -- and then there is a nuclear war that decimates the city and apparently most of the world. The shift in narrative is stunning -- and effective. What a weird little book. I’m not sure what to make of it. A wonderful, beautifully written novel about life in Los Angeles whose bulk of pages foreshadow an apocalypse you'd expect with an aftermath you might not. Mad weird. There were some moments I really liked, some beautifully phrased passages that really made one think, but overall it was kind of all over the place. She jumped from explaining her modern day situation with men and her daughters; to the world suddenly ending and her shoving jewels in her hand. Strange. Carolyn See was the author of ten books, including the memoir, Dreaming: Hard Luck and Good Times in America, an advice book on writing, Making a Literary Life, and the novels There Will Never Be Another You and The Handyman. She was the Friday-morning reviewer for The Washington Post, and she has been on the boards of the National Book Critics Circle and PENWest International. She won both the Gug Carolyn See was the author of ten books, including the memoir, Dreaming: Hard Luck and Good Times in America, an advice book on writing, Making a Literary Life, and the novels There Will Never Be Another You and The Handyman. She was the Friday-morning reviewer for The Washington Post, and she has been on the boards of the National Book Critics Circle and PENWest International. She won both the Guggenheim Fellowship and the Getty Center fellowship. She lived in Pacific Palisades, California. See also wrote books under the pen name Monica Highland, a name she shared with two others, her daughter Lisa See and her longtime companion, John Espey, who died in 2000. See was known for writing novels set in Los Angeles and co-edited books that revolve around the city, including a book of short stories, LA Shorts, and the pictorial books Santa Monica Bay: Paradise by the Sea: A Pictorial History of Santa Monica, Venice, Marina Del Rey, Ocean Park, Pacific Palisades, Topanga & Malibu, and The California Pop-Up Book, which celebrates the city's unique architecture.